Love cosplay? Love fandoms? Love to write? Then write for us! We’re looking for established writers who know their way around a keyboard. 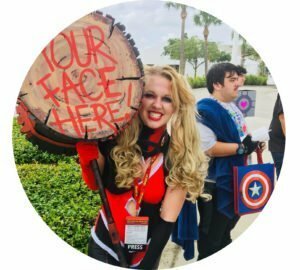 Even if you don’t cosplay, we like articles about art, movies, TV shows, and generally anything related to your favorite fandom! Check out our Articles section for a better idea of what we write here on Cosplay & Coffee. To qualify to be a writer for Cosplay & Coffee, please follow us on social media (to your right) and please read the following Submission Guidelines and fill out the form at the bottom. Fill out the form at the bottom of this page, giving us details on your writing experience and a brief outline of the topic you wish to write about. We will respond within a few days and work with you on developing your piece and setting up a tentative post date. You will be required to submit a draft in a .doc format at least one week before posting. Mostly, this is because we’re really excited to see what you’ve created, but also because sometimes a rewrite is required. Don’t fret if we ask for a rewrite, it’s part of the editorial process. Word count should be no less than 500 words and no more than 1500. We love multimedia posts. Give us something pretty to look at as we read your stuff. Images, video clips, and gifs are all encouraged by our admins. Just don’t overdo it. Please include links to the media you would like to use in your submissions. Always get permission to use someone else’s work. It is extremely important that you obtain permission before including anyone else’s work in your piece. This includes, but is not limited to: fiction, quotes, photography, edits, fanart, etc. If it can be copyrighted, ask permission. If you didn’t make it, ask permission. Unfortunately, we cannot pay you at this time, but think of this as free publicity and a chance to hone your writing skills. We are happy to include links to any/all of your social media accounts, and to promote your writing in any way that we can. Proper grammar and punctuation are appreciated so that minimal editing is required. If you struggle with grammar, try Grammarly. It’s free.